Notes: Based on the "Power Dolls" video game series. Well, we're this, like, all-female troop called the, like, Power DoLLS, or, like Detachment of Limited Line Service (get it, DoLLS!) and, like, we suit up in these way-cool power loaders, and, you know reenact scenes from other mecha shows! Umm, what is this, Valley Girl Gundam?!? Faugh! This is another of those series which I'd watched at one point in time in the past and decided that it might be better to write a review on a day I was home sick, because by that point I'd have nothing better to do. It sure doesn't help that I saw the English dubbed version. (See our previous ADV dubbing complaint on New Kimagure Orange Road: Summer's Beginning.) But I wouldn't blame ADV for neglecting to cast a stellar ensemble for this utterly forgettable OAV that doesn't even have enough fan service to hold anyone's attention. For starters, the title itself has to be one of the most forced acronyms in the history of anime. "Detachment of Limited Line Service"?!? A piece of nonsense Engrish if I've ever seen it. And the show doesn't get much better after the title, either. Weak characters (whose names I couldn't remember even if I -tried- to drill them into my memory, but I'm sure they were supposed to be Chinese) piloted mildly interesting mecha (sorry, can't let go of that joke) into uninteresting situations that I think were badly copied from episodes of Gundam 08th MS Team. And, naturally, the "main" character gets cut off from the main force, must go through an angsty moment with a teddy bear before her hometown is destroyed. A lamer attempt at pathos could not be conceived. Aargh. What's frustrating about this anime is that the art and animation aren't that bad. Mind you, this isn't Cowboy Bebop level, but it's still decent enough to feel like a massive waste of time and energy. A feeling of half-heartedness pervades Power DoLLS, as if it wants to be more than a lame video game anime, but doesn't know how. Even the music just screams "I was a video game once!" and it's pretty painful, though the end track is sheer torture. However, the action and shower scenes can't redeem a badly-acted, badly-written anime that wants to be Gundam with Riot Grrls and fails miserably. I knew it was going to be bad when I heard the commanding officer utter, "Let's go, Dolls!" as they went into battle. How could you possibly take this thing seriously? And at the same time, this show couldn't remotely be mistaken for a parody, because it does take itself seriously. Maybe this would've been more palatable if at least it made fun of itself, but no! This is supposed to be a serious anime, darnit! Our verdict - don't even bother with this one. 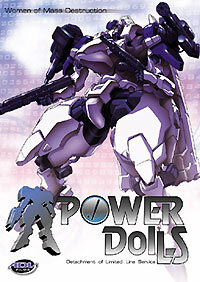 Power DoLLS is even worse than it sounds. Recommended Audience: Well, there's some violence, and there's the Gratuitous Shower Scene, which fails to elicit any attention from me (and that's a bad sign, folks). Some rough language, too. Mature teens and above (though they'd wonder why they wasted their money on this rental afterward).